What a great chat! I love this community so much. It is so great to be able to discuss things over social media and have input from so many directions. 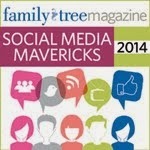 Thank you so much for all the input I've received on my Open Letter to the Genealogy Community post over the weekend. I think this has been a good discussion to have. I'm so thrilled to have so many friends who are as eager as I am to advance the world of genealogy. I'd like now to take it to another step. I eagerly read the comments everyone had (and thank you for those of you who shared it further) and I was happy to see Jane Schwendinger and Thomas MacEntee encourage the conversation in a positive direction. But I still saw alot of "they" this and "they" that and "they" should. I would like to see some more "I will". It is amusing to me that we all think of life that way--me included--but it is time to look inward. So I'd like to challenge you all to help me make a list of what we are going to do to embrace the new influx of family historians. 1) I'm going to take some kind of interactive game or activity to every future conference booth that we do. (If you have any ideas, I'd love to hear them.) I think we can shake up the conference scene and make it more accessible. And I think that will make it more fun for all of us who are regulars there too. 2) I'm going to try to make my presentations more interactive and engaging. I'm going to start by looking at where I can insert more discussions with and within the audience. And then I'm going to see what I can do about more multi-media (that is going to be tough but I'm going to stretch). 3) I'm going to keep a positive attitude. I'm going to focus on how awesome it is that newcomers are interested, and try to brush off the quirky, strange, copyright naive, thoughtless, and sometimes even ignorant and rude things they do. I'm going to try to stay away from my occasional "holier than thou" impulses and try not to talk down to anyone. I'm going to be respectful and try to always be helpful and patient, no matter what. Just because they don't know the nuances of family history doesn't mean that they aren't a brain surgeon in some other area of life. That's what I'm shooting for. What are you going to do? Thanks for tagging me, Janet! I do a lot of public speaking for our military families who are in the deployment cycle, and my mentor taught me that a presentation is only as good as the take-away that the audience leaves with. She said that many believe that a syllabus or handout can serve as a take-away, but she thinks people are better able to process the content of your presentation if they're able to have a take-away that directly pertains to them. When I transfer that idea to my genealogical presentations, I can imagine pausing at some point in the middle of my talk, asking people to take out a sheet of paper, and asking them to answer a question specific to them (as it pertains to the subject matter of the presentation). Awesome Katherine. Thanks! I think we're all going to learn alot from the other responses too. This is a great suggestion. You've got my wheels turning too. 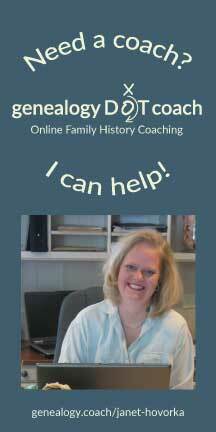 May I offer the opinion of a non-professional, beginning genealogist and family historian? I have loved both of your thoughtful, well written posts. Even though I am not a well-known genealogist in the genealogical world, I am genuinely trying to be better, despite my many mistakes. I am, however, a former teacher. I was, if I may say so about myself, a very good teacher. Through my teaching, I learned that student engagement is a very good indicator of student knowledge. It is also an indicator of motivation for change. We know we can measure student learning by change in behavior. Therefore, I feel your suggestion for student engagement is not only a wonderful idea, it is vital if we want change in behavior of ourselves and our fellow genealogists and family historians. I teach a class on getting ideas for family stories. They can be idea for your own stories or stories of an ancestor. During the class, I tell the story of my brothers having a tomato fight in the house. It engages and entertains the audience, but it also gets their ideas flowing. Not only do they laugh at my story, but stories of their own come to their mind. I have them write the ideas down. If there is time, I have them tell their ideas to someone else in the class. After teaching this class, without exceptions, people come up to me or call me later and tell me that they now have ideas for stories and have started to write them down. I attribute this totally to the engagement that happens in the class, just as you have suggested. I now pledge to make time for sharing in all classes that I teach, thus increasing the engagement. I also pledge to ask more questions, take more classes and become a better, more knowledgeable and proficient practitioner of genealogy and family history. Thank you, Janet, for your kind, thought-provoking articles. You are wonderful. Good for you for doing a "call to action." I have always believe that there is no "them" and "us" but just people who have various degrees of interest and various years of experience. I have always believed in education having been involved in many conferences, institutes, in-classroom, and online educational opportunities. So I don't see it as "how to get the newbies to advance" but "how to get everyone to take one step forward" no matter where you stand. My favorite thing to do is talk with people and let them tell me where they are educational-wise and what their goal is. Then I can best advise them as to which program, articles, email list, blogs, class, institute, or books to read. The saying about not knowing what you don't know goes here when those with less years in don't know about what is out there or the most efficient way to utilize the opportunities. So my personal call to action will be to continue to try to guide people in the way their goals and budget allow. Those with less years of experience also have to realize that the magic of certain TV commercials or shows of instant ancestors doesn't work in real life. It does take years to work on a single brick wall ancestor. This should not scare people but intrigue them when that case study is finally solved and what the solution was. Thank you. And please don't forget about the "history" part of family history. Political, cultural and social conditions of the time made our ancestors what they were and contributed to what we are today. I think I learn more about my ancestors from history books, chronicles and old newspapers than I do from finding out who begat whom.